Books can be stored beneath the wide steps of this staircase, designed by Zminkowska De Boise Architects to connect the two halves of a split-level living room inside a renovated London flat. London-based Zminkowska De Boise Architects made alterations to the ground floor of a two-storey Edwardian terrace, occupied by a couple and their young children. The project is named Rosa and John's home, after the two clients. The architects created a series of large new openings through the existing interior walls, merging the ground-floor living spaces to create an open-plan dining room and kitchen. They then added a set of wide white steps with built-in book storage, connecting the main living space at the front of the house, with a "snug" that sits at a slightly lower level towards the back. The steps can used by the residents as an informal seating area, while nooks on either side of the stairs form more structured spaces for reading or studying. "The steps have been appropriated as a place for family members to sit, chat, read, write, draw, perform, and play, and the snug has become the centre of the home and of family life," explained architects Hanna Zminkowska and Richard De Boise. The new open-plan layout allows light to filter from a bay window at the front of the living room through to the glazed patio doors at the back of the kitchen. "Typical of houses of the period with relatively narrow but deep plans, the centre of the house was formerly dark and disconnected from the rest," said the architects. "The snug has become a naturally lit, well connected space, with views through the living area to the front garden and street, and through the kitchen and dining area to the back garden." 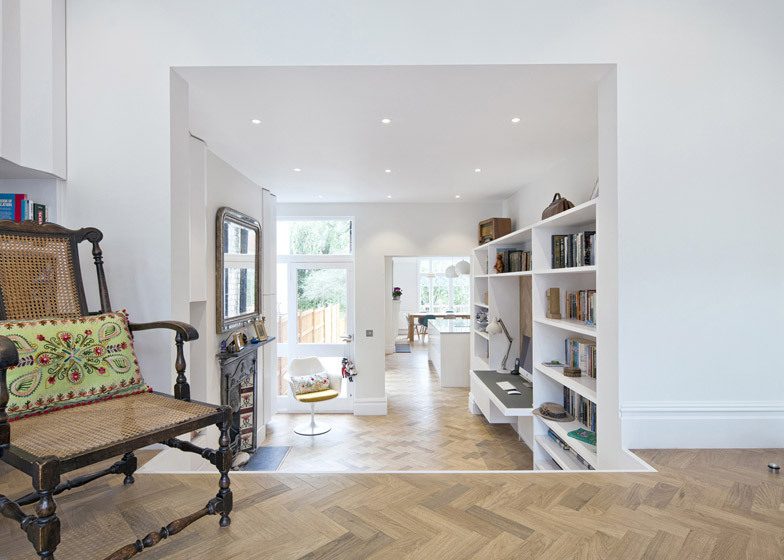 Lacquered oak parquet flooring with a herringbone pattern was laid throughout the ground floor to help create a sense of continuity between the newly united spaces. Beside the existing fireplace, an alcove backed with the same parquet pattern as the floor forms a seating area on side of the staircase. The level of the seat connects with the third step, while a white cupboard overhead is fronted by zigzagging doors. A bookshelf on the opposite side of the space features shelves that follow the heights of the steps. A grey desk is set into an alcove, creating a generous workspace. "The scheme makes the most of the split floor levels, as floors in the snug become walls, and steps become shelves extending around the walls," added the architects. Photography is by Tom Cronin and Zminkowska De Boise Architects.